Like your wardrobe, you should change up your foundation every season for the most flawless finish. Since skin is drier in the winter, a moisturizing foundation hydrates dry, flaky skin, while a summer glow requires lighter coverage. 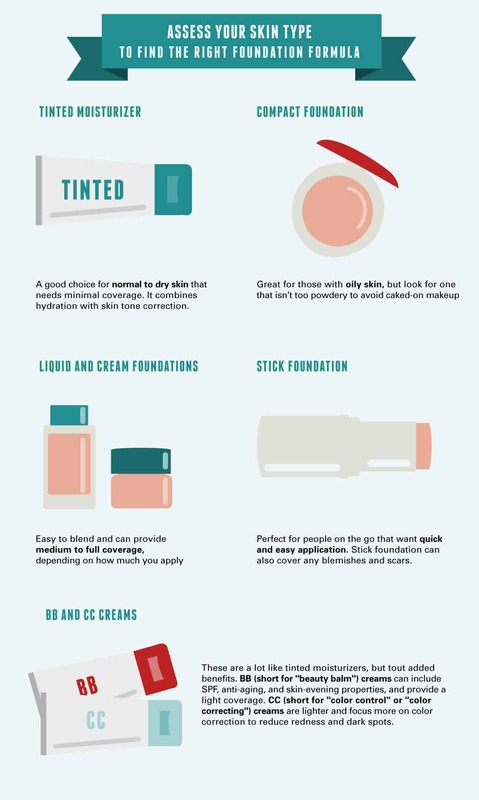 Follow our tips for perfect coverage year round. A good skincare regimen is crucial during winter months; otherwise foundation can make dry skin and dead skin buildup more obvious. Exfoliate two or three times a week (alternate with a gentle cleanser since too much buffing can cause irritation) and finish with a thick moisturizer or facial oil. 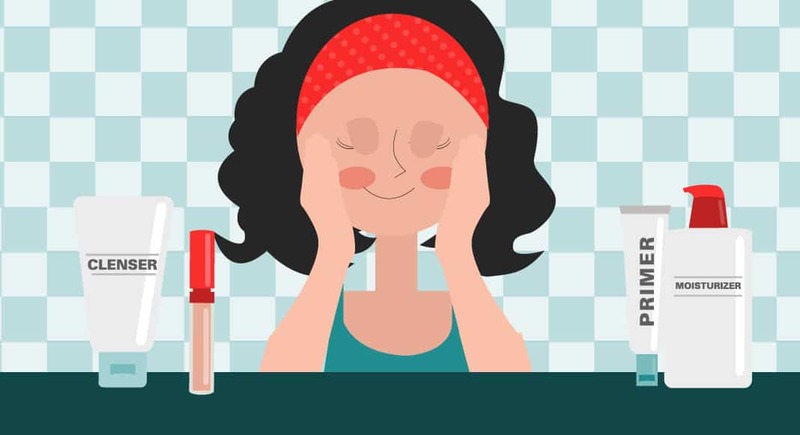 Avoid oil-free foundations, even if you have oily skin. Oil-based foundations help lock in moisture (make sure to fully remove all makeup before bed). Look for a formula in a warm sheer color that gives a natural glow; cold weather can make pale skin look pasty. Minimize powder and bronzer; too much will look matte and unnatural. During the warmer months, a foundation that’s suitable in winter will probably be too light and thick. Keep two colors on hand—one for winter, and one for summer that’s about one or two shades darker. The trick is to find one that doesn’t totally mask sun-kissed skin. Look for a lighter coverage foundation and apply with a sponge for a more sheer finish. During hot summer days, a tinted moisturizer with SPF may be a good alternative since it can handle sweat better than most foundations. But if you’re set on foundation, apply a primer first (after moisturizer) to keep makeup in place, and then finish with a translucent powder. Look for oil-free formulas, preferably in compact form, to soak up excess oil. Carry oil-blotting papers to use throughout the day to remove shine without wiping away makeup. Tweak the color when necessary during fall and spring by mixing foundation shades, or mix your usual foundation with a lightweight concealer that’s one shade darker. (Just make sure both products are the same formula.) Or revert back to a tinted moisturizer, which is more forgiving than a wrong shade. The easiest way to find the perfect color is to sample several shades at a department store. If you don’t want to splurge on high-end brands, test them and ask for samples, then bring them to a drugstore to find a similar color. Test the color on your jawline in natural light: It should disappear on your skin without blending. Foundation needs a clean, smooth surface for proper blending. Cleanse, then apply moisturizer. Wait five minutes for it to absorb into the skin. Primer is not necessary unless you’d like your makeup to last all night, or want to reduce the appearance of large pores. If you use concealer, apply it after foundation—you’ll end up using less and the base will prevent it from creasing. To apply a cream or liquid, use your fingers, a brush, or a sponge. 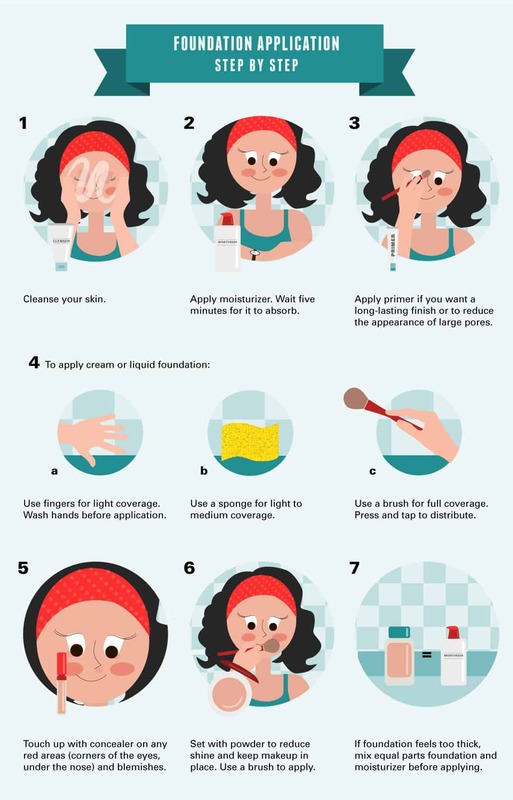 Applying with fingers gives the lightest coverage and most control, but wash hands first to avoid transferring any dirt or bacteria to your face. Use a sponge for light to medium coverage and a brush for full coverage. Instead of wiping the brush across your face, press and tap to distribute; wiping will create a caked-on look. Touch up with concealer on any red areas (corners of the eyes, under the nose) and blemishes. Set with powder to reduce shine and keep makeup in place. Use a brush to apply powder, but keep it light; you can always add more. Foundation feeling too thick? Mix equal parts foundation and moisturizer in the palm of your hand before applying. If your makeup settles into fine lines by midday, tap on a small amount of moisturizer and blend.